We have been underway from Haderslev for three weeks and in that time done around 530 miles visiting some amazing quaint towns and harbours, some of which we know we would have had no chance of getting into during the peak season of July and August. Amongst the many things to prepare and sort out on the boat was a little bit of tradition and we are pleased to say all duties are now completed. 1. 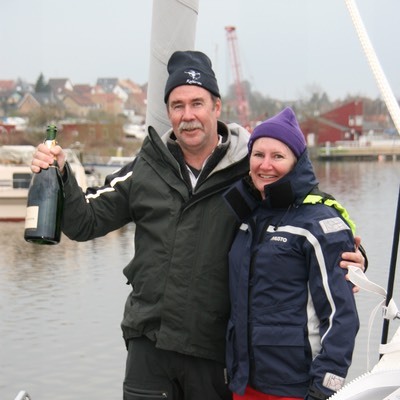 Christen the boat with champagne - Completed with Moet on the 12th April. 2. 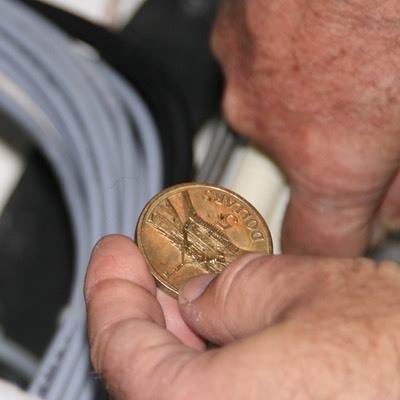 Place a coin under the mast - we selected a five dollar coin we had stowed away from the 1988 Bicentennial Year. It seemed appropriate being a significant year in the history of Australia not to mention the year we were married. 3. Toast with a tot of rum and ensure Neptune gets his share. Jobs done now on with the sailing.